Today, on the way back to Koriyama from Aizuwakamatsu, I stopped at Fukushima Geihinkan, Inawashiro Town. Autumn leaves were splendid in the garden. 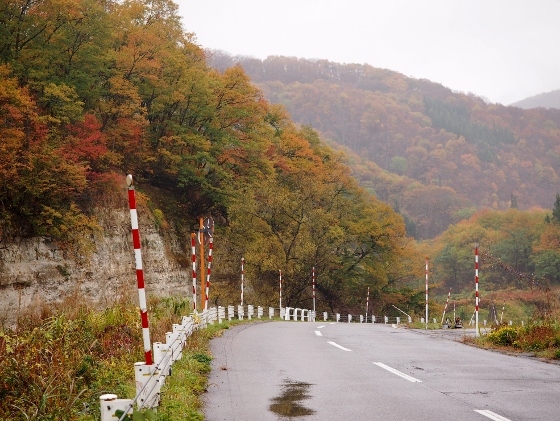 Further on the way, I also met with beautiful autumn colors along the National Route 49 near the exit of Nakayama Tunnel and also at Numagami Hydroelectric Power Plant. 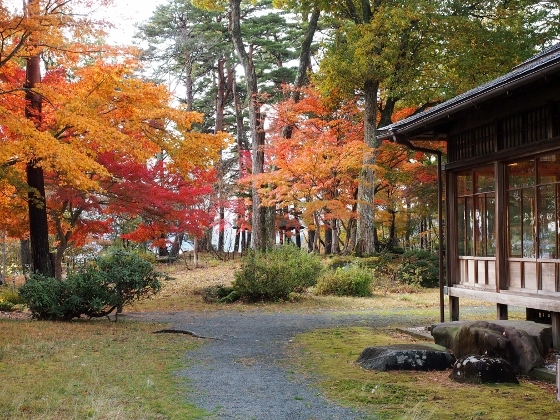 Fukushima Geihinkan is a former Imperial Villa located just beside Lake Inawashiro. It was built in 1922 and later in 1952 it was given to Fukushima Pref. 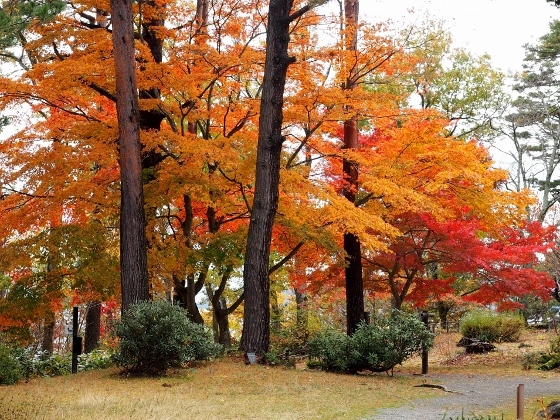 It includes a large beautiful garden with a spectacular view of Lake Inawashiro. It is also designated as a National Important Cultural Property. 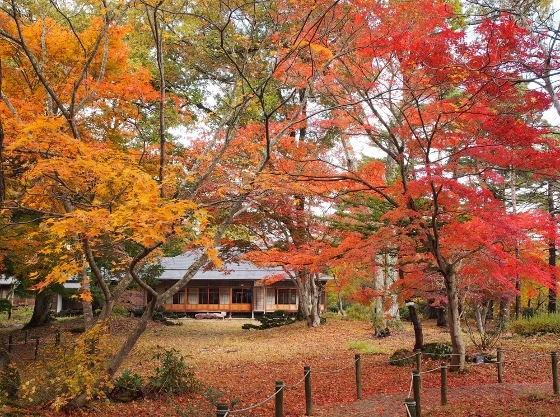 In this season autumn leaves create beautiful scenery including the building and the garden as shown above. From the garden I also found several wind turbines rotating on a mountain far on the right. 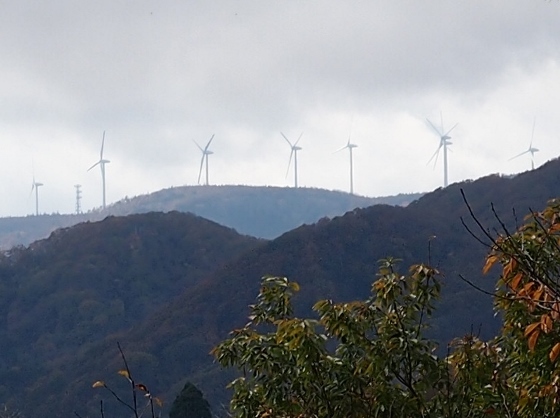 These belong to Aizuwakamatsu Windfarm which generates 16MW of electric power. 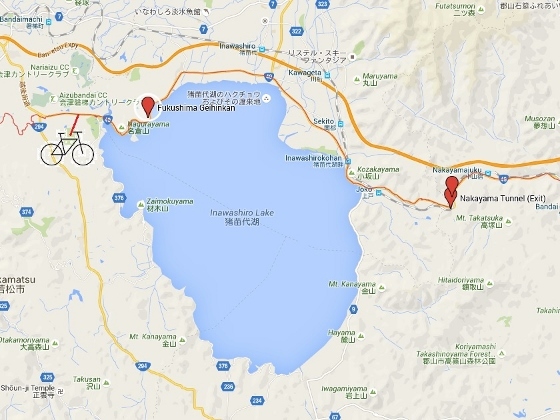 Leaving Fukushima Geihinkan, I pedaled along the northern shore of Lake Inawashiro to the east. 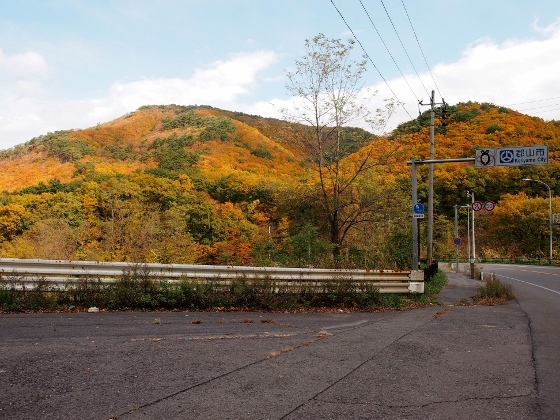 Pedaling through Nakayama Tunnel to the exit, I was already in Koriyama City and colorful mountainside came into my eyes as shown above. 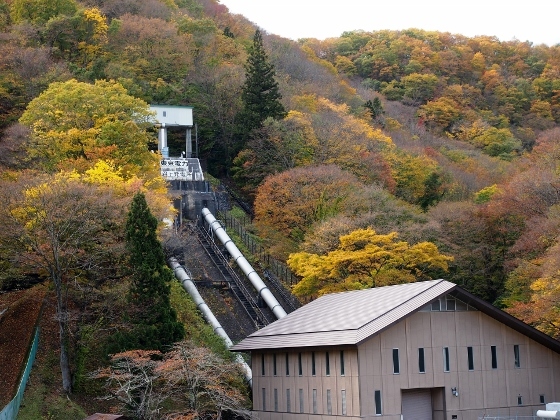 Soon after, I passed beside Numagami Hydroelectric Power Plant on the left and it was also surrounded by beautiful autumn colors as shown above. 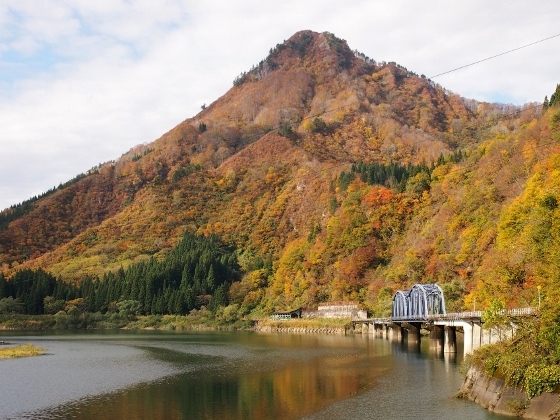 It is the second oldest hydroelectric power plant in Fukushima and it contributed heavily to the development of Koriyama City. Water from Lake Inawashiro through Asaka Canal is used for the power generation. 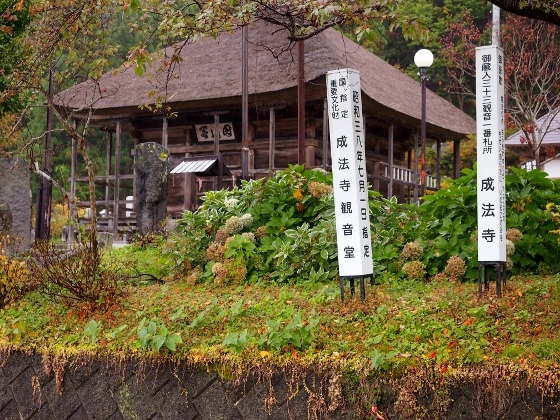 Today I left Tadami Town and headed toward Nishiyama Onsen (=hot spring) in Yanaizu Town along the National Route 252. 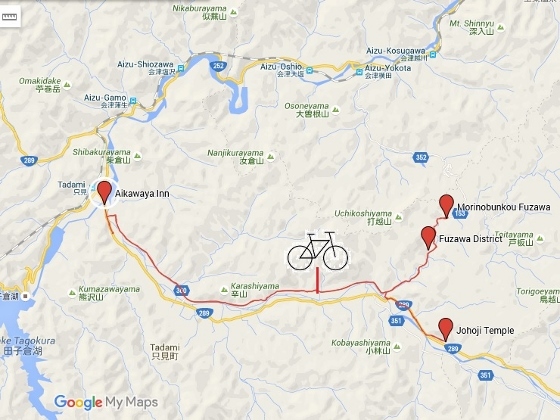 The route also paralleled with JR Tadami Line and the Tadami River. On a bridge near JR Aizushiozawa Station, I could see the large Tadami River with a bridge for JR Tadami Line in the right and with Mt. Gamo in the back as shown above. However, Tadami Line train is not running over the bridge today due to recovery work suspension. Tadami Line recovery charity and support group is now working on recovery action. 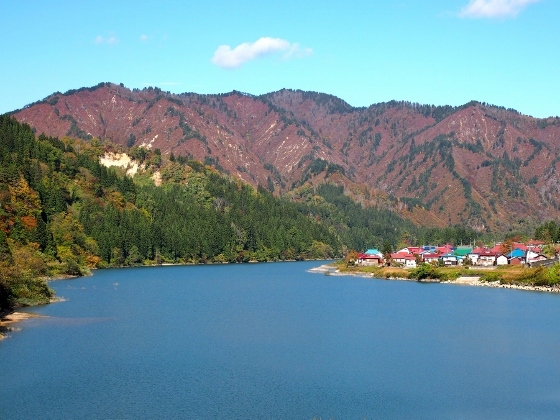 Picture above shows broad and quiet Tadami River with mountains in the back and local village of Oshi in the right. This view is from a viewpoint just ahead of JR Aizukawaguchi Station. 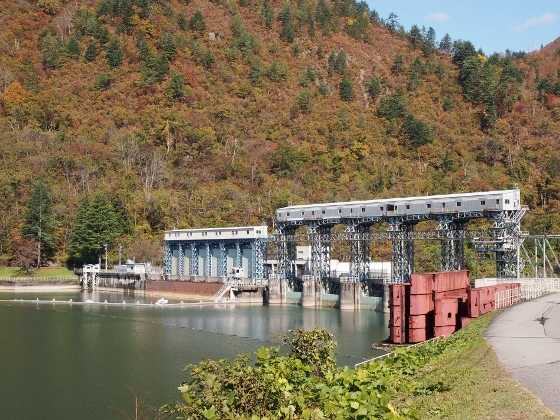 There are more than 10 hydroelectric power plants along the Tadami River. Ueda Power Plant shown above is a medium scale hydroelectric power plant located near JR Aizunakagawa Station. 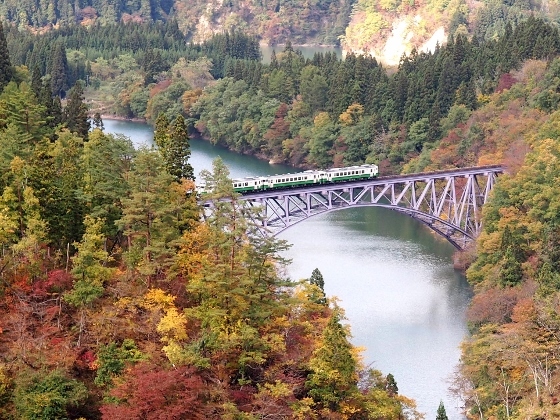 There is a popular viewpoint of Tadami Line train traveling on a bridge over Tadami River in Mishima Town. Picture above was taken from the viewpoint today. The train was surrounded by autumn colors. Finally I arrived at Nishiyama Onsen in Yanaizu Town. 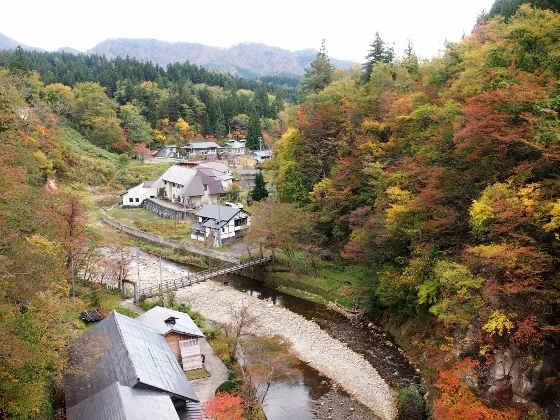 The whole hot spring site is covered with autumn colors as shown above. 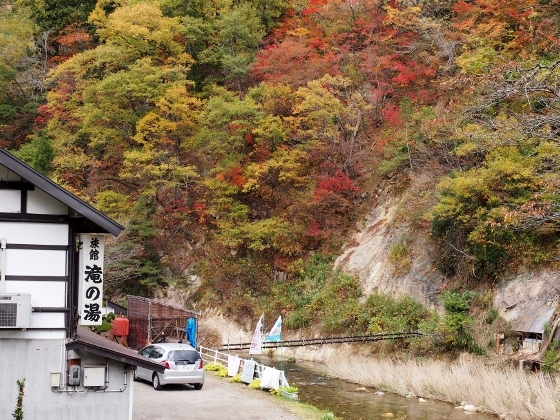 I stayed at Takinoyu Inn tonight which is located beside the Takiya River with beautiful autumn leaves as shown above. The inn is a member of Japan Association of Secluded Hot Spring Inns and has its own best quality chloride hot spring sources. It really was an excellent and refreshing bath. 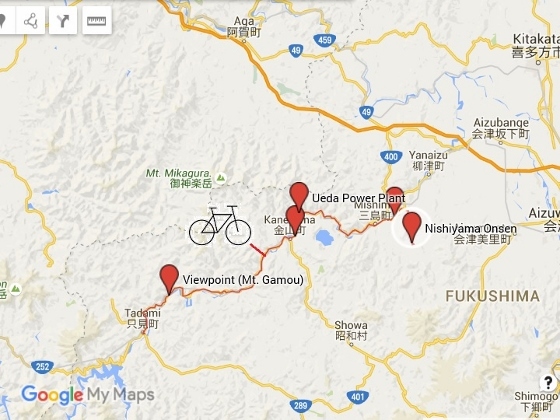 Today, I pedaled to Fuzawa District of Tadami Town. The district spreads along the Fuzawa River some 15km east of the town center. Then I visited Johoji Temple which is one of the National Important Cultural Properties in the town. It was all day rain and foggy today. 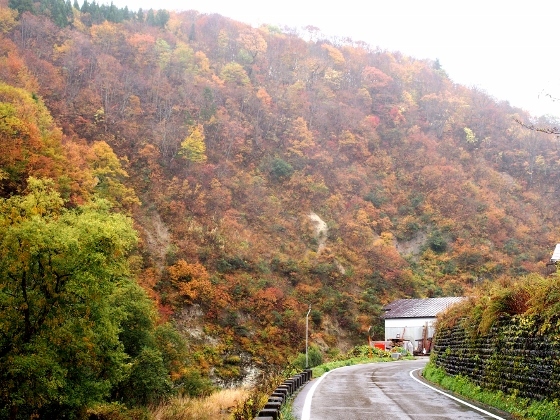 As I pedaled around Fuzawa District, I enjoyed autumn colors still remained there although they have started to fade out. Some of the pictures I've taken are shown above. I could imagine how spectacular it was in the best time and in a clear day. 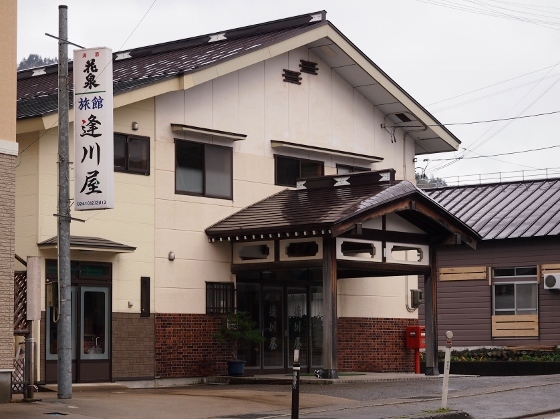 In the district, there is an inn called "Morinobunkou Fuzawa" as shown above. It is an old abolished branch school building refirbished into a simple inn. Then I moved further east and visited Johoji Temple as shown above. 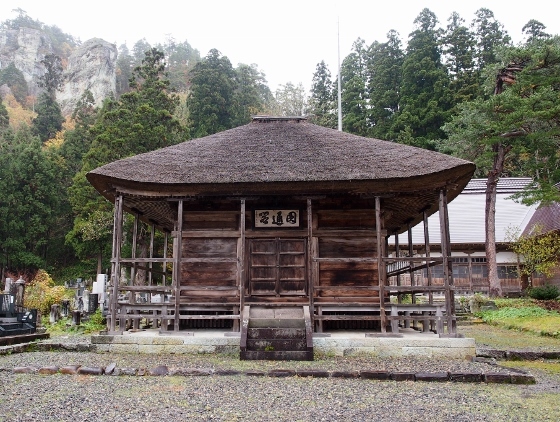 The building was first build in 14th Century or Kamakura Period and was rebuilt in 16th Century. It represents Buddhist culture in this region. 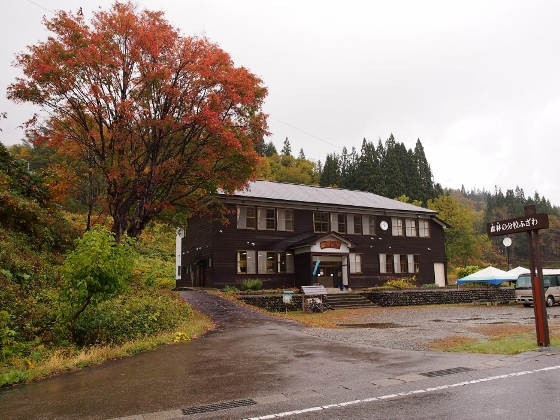 When I visited Tadami Town, I used to stay at Aikawaya Inn as shown above. All the meals were handmade and healthy. This morning a delicious Nango tomato was served. 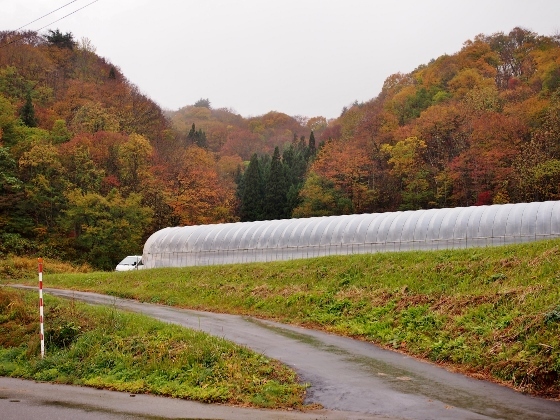 This is a specialty tomato grown at Nango District of Minamiaizu Town not far away from here. The toilet is common but has shower type one. The bath is not onsen (=hot spring) but is relaxing. And the charge is reasonable.